(a) Brick-earth burnt in kilns and (b) Concrete. Brick-earth used for manufacturing brick tiles is more pure and is prepared more thoroughly than the one used for manufacturing bricks. Tiles, being thinner requires careful burning. (Fig. 3.1.) measure about 25 cm × 15 cm to 28 cm × 18 cm and from 10 mm to 17 mm thick. 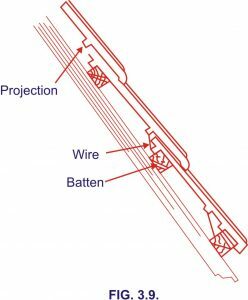 These may have a continuous projection at one end or two small projecting nibs (as shown). These nibs should not be less than 2 cm wide cm and 1 cm deep. Camber should be between 5 mm and 10 mm for hand-made tiles. The camber could be reduced for machine-made tiles. The tiles, as shown in Fig. 3.2. are curved in section. These are 33 cm to 38 cm long and 23 cm to 28 cm wide. Implements needed for its moulding are a mould, a horse, a bow and a strike (Figs. 3.3 to 3.6). for moulding pan tiles a ball of prepared clay is pressed well to fill all corners of the mould. All surplus earth is cut with the bow and removed. Strike is then passed over the wet top of tile in mould. It is done so many times as to render the top surface of tiles smooth. The tile is then carefully removed and placed over an already burnt tile to dry. After the tile has dried a little it is then placed on the curved top of horse and pressed with hand to make it curved. After another five to six hours the raw tile is once again shaped on the horse and its edges trimmed with a sharp knife. To stop the clay from sticking to the mould or horse their top is sprinkled over with ash every time before use. These are semicircular in section and taper along the length (Fig. 3.7.). Diameter at larger end is about 23 cm and at the smaller end it is about 20cm. Rows of these tiles are laid with the concave side up. Then rows of same tiles with convex sides up are laid to cover the adjoining edges of every pair of the previously laid tiles. These consist of two sets of tiles. the lower ones are flat tiles with upturned sides. End widths reduce from 27 cm to 23 cm and the length is about 38 cm. The over tile is half round in section and tapers from 16.5 cm to 12 cm in diameter. Tapper allows the tile in the next course to fit in (Fig. 3.8). Half round tiles are moulded on a potter’s wheel as a round tapering cylindrical tile. Two longitudinal cuts are given to the cylinder while still not dry. With this it is easy to break it into two semicircular tiles after burning. 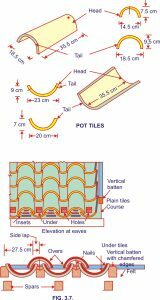 These are flat pattern tiles with suitable key projection. About 16 tiles are required to cover one square metre of roof. 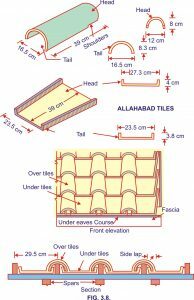 Arrangement of Mangalore tiles on a slopping roof is shown in Fig. 3.9. For details refer to IS : 654-1972. Tiles of any shape, size or colour could be made with cement concrete. These are more strong, durable and weather resistant. 8. Flooring tiles or Paying tiles. These are usually thicker than roofing tiles and vary from 15 mm to 30 mm in thickness. Their shapes are square, hexagonal or of any other geometrical pattern and may be coloured, if desired. 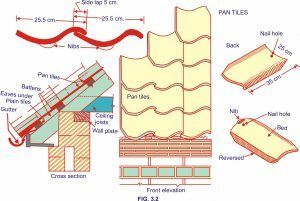 Depending on properties of clay flooring tiles are classified as class 1, class 2 and class 3 tiles. Maximum water absorption percentages in case of these are 10, 19 and 24 respectively. Minimum average flexural strength kg/cm width in respect of these is 6, 3.5 and 2.5 respectively. For details refer to IS : 1478-1669. These are curved tiles made in various shapes and sizes to suit the work in which they are to be used. 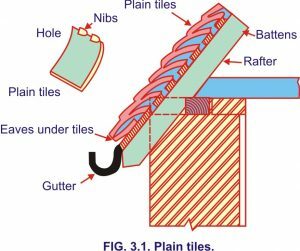 Tiles to be used in the construction of sewage carrying drains should be glazed. (i) It should be of a regular shape and size. (ii) It should be free from twists, cracks or flaws. (iii) It should be well burnt and have uniform colour. (iv) It should give a clear ringing sound when struck. (v) It should be sound and hard. (vi) Its broken surface should show an even and compact structure.